The RV Doctor: 34 Fire Facts That Can Save Your Life! 34 Fire Facts That Can Save Your Life! At best, a fire in your RV can delay or ruin a vacation. At worst, it can mean injury, financial loss, and even death. 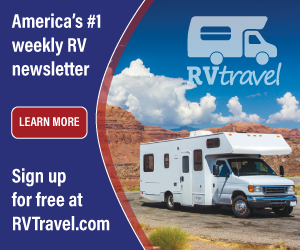 Unfortunately, RV fires are one of the largest causes of motor coach loss in America today. The following tips can help you recognize the most common bus fire hazards and protect yourself from the damage and injury fires are notorious for causing. 1 A pinhole-size leak in a radiator or heater hose can spray antifreeze on hot engine parts. Antifreeze contains ethylene glycol concentrate and water. When the water boils off, the remaining ethylene glycol can self-ignite at 782 degrees F. During your monthly fire inspection, check all hoses for firmness, clamp tightness, and signs of leaking. 2 Rubber fuel lines are commonly used to connect metal lines to the electronic fuel injection system, or to the carburetor in older coaches. Check all the lines and connections between the fuel tank and the engine on a monthly basis. If there is any sign of a leak, have the lines replaced and the entire system inspected by a qualified mechanic as soon as possible. 3 A hard-working engine manifold can get as hot as 900 degrees F. The heavy insulation in the compartment reflects the heat back to the top of the engine, and a fire can easily break out. Inspect your radiator and have any problems repaired by a qualified person as soon as possible. 4 Grease, oil, and road dust build up on the engine and transmission, making them run hotter. The grime itself usually doesn't burn, but if combined with a fuel leak or short-circuited wire, a fire could start. Keep your coach's underpinnings clean, and it will run cooler, more economically, and longer. 5 A dragging brake can create enough friction to ignite a tire or brake fluid. Some of the worst fires are those caused when one tire of a dual or tandem pair goes flat, scuffs, and ignites long before the driver feels any change in handling. At each stop, give tires at least an eyeball check. When tires are cool, tap your duals with a club and listen for a difference in sound from one tire to the next. You can often tell if one is going soft. 6 Spontaneous combustion can occur in damp charcoal. Buy charcoal fresh, keep it dry, and store it in a covered metal container. Rags soiled with auto wax or cleaners that contain petroleum products or other oil-based cleaning materials can also spontaneously combust if disposed of in a combustible container. Put dirty cleaning rags in a metal container with a lid. 7 A hot exhaust pipe or catalytic converter can ignite dry grass. 8 Driving with propane on can add to the danger if you are involved in an accident or have a fire. Most refrigerators will keep food cold or frozen for eight hours without running while you travel. Shut the propane off at the tank. 9 If you store your coach, be sure to check the flue before starting your refrigerator on propane. Birds and inspects can build nests and clog the flue, causing a fire or excess carbon monoxide to enter your coach. 10 Batteries produce explosive gases. Keep flame, cigarettes, and sparks away. Be sure your battery compartment is properly vented. Keep vent caps tight and level. Check your battery monthly. Replace swollen batteries immediately. Use extreme care when handling batteries-they can explode. 11 Have any wiring in your coach done by a capable electrician, and use common sense in using any electrical aid. Check all 12-volt connections before and after every trip. Most coach fires are caused by a 12-volt short. 12 Gasoline and propane can pose an immediate, explosive danger. Though diesel fuel is less volatile, it dissipates more slowly, so it remains a danger longer. Deal at once with any leaks or spills, and use all fuels in adequately vented areas. 13 Even if the flame on your galley stove goes out, gas continues to flow and could result in an explosion. A stove should never be left unattended or used to heat your coach. Open propane flames release high levels of carbon monoxide. 14 In a compact galley, all combustibles-from paper towels to curtains-are apt to be closer to the stove, so use even more caution in your coach than you do at home. A box of baking soda-the ingredient in powder extinguishers-can be used in lieu of a fire extinguisher for minor galley flare-ups. 15 Develop a plan of action before a fire occurs. 16 Make sure all travelers know what the smoke alarm sounds like and what to do when they hear it. Test your smoke detector regularly. 17 Have at least two escape routes-one in the front and one in the rear of the coach. As soon as they're old enough, teach children to open hatches and emergency exits. 18 Review with everyone the "Stop, Drop, and Roll" rule so they know what to do when clothing is on fire. 19 Make sure visitors can open the front door. Not all manufacturers use the same lock and latch assembly. 20 Choose a rallying point where everyone will meet immediately after escaping, so everyone can be accounted for. 21 Show travelers how to unhook electricity (screw-on cords can be tricky) and how to close propane valves, in case either of these measures is called for. 22 Practice unhooking your tow vehicle as quickly as possible to avoid spreading the fire to other vehicles. 23 Re-emphasize to everyone aboard that objects can be replaced, people can't. Never stay behind or re-enter a burning coach to retrieve anything. 24 There are plenty of fire and life safety tools that can save lives, but for them to be effective, they must be in working condition and you must know how to use them properly. 25 You should have five fire extinguishers for your coach--one by the front door, one in the kitchen, one in the bedroom, one outside of the coach in an unlocked compartment, and one in your tow vehicle. Make sure family members know how to use the extinguishers and understand which extinguishers are effective on various fires. 26 During your monthly inspection, check the fire extinguisher gauge to determine if there is pressure in the extinguisher. If the gauge indicates empty or needs charging, replace or recharge the extinguisher immediately. To test non-gauged extinguishers, push the plunger indicator (usually green or black) down. If it does not come back up, the extinguisher has no pressure to expel its contents. If you need help testing your fire extinguishers, check with your local fire department. 27 Do not pull the pin and expel the contents to test your powder extinguisher. If you use a portion of the powder extinguisher, have it refilled or replaced immediately. When you have a fire extinguisher refilled, ask to shoot off the charge first (most refill stations have a special place where this can be done safely). This lets you see how far it shoots and how long a charge lasts. 28 Invert and shake your dry-powder or dry-chemical extinguisher monthly to loosen the powder. The jarring of the coach does not loosen the powder; in fact, it packs the powder, which may make your extinguisher ineffective. 29 Deadly, invisible, odorless CO usually results from exhaust leaks or misuse of heating devices. Be sure to put your CO detector in the bedroom. The proper location is on the ceiling or on an inside wall at least eight inches from the ceiling and at least four feet from the floor. 30 Liquid petroleum gas, like gasoline fumes, tends to pool in low spots in the coach until a spark sets it off. Newer motorhomes are equipped with an automatic shut-off for when its sensor detects an LPG leak. If you have a leak, be sure to shut the propane off at the tank. 31 The first rule of RV firefighting is to save lives first and property second. Get yourself and your family to safety before attempting to extinguish a fire. Only if you can do so without endangering yourself or others should you use firefighting aids on hand. 32 Get help. Adults and older children should know how to dial 911 or 0, and how to get emergency help on any CB, VHF, or ham radio available. 33 It's crucial to know your location so firefighters can find you. 34 If you have a quick-disconnect fitting on your water hookup, it can be unhooked instantly to fight a fire. If a nearby coach is burning and you cannot move your coach but can safely stay close enough to keep it hosed down, you may be able to save it.